When the subject of Lovecraftian films is discussed, it’s only a matter of time before someone suggests that any film containing a “Gill Man” of sorts fits the bill. The argument is that since Creature from the Black Lagoon came out in 1954 and The Shadow Over Innsmouth was published in 1936, H.P. Lovecraft deserves the credit for inventing such creatures in fiction. This is simply not true. There are examples of humanoid fish creatures in the legends of many cultures, but they are admittedly buried under a lot of other monsters and “half human and half fish” beings that are depicted as being literally a human top half on a fish bottom. Although Finfolk live under water and desire human mates, they look completely human while the look of the Kappa differs from artist to artist (with most modern depictions being turtle-like). Some descriptions of the Adaro make them sound like a “Gill Man,” but most describe them as a type of mermen. Most depictions of Bishop Fish and Sea Monks emphasized the human aspect, as did most other descriptions of humanoid beings that were said to live in water. While modern artists depict the Grindylow as a fishlike humanoid, its classic description is merely that of a green demon. The Siyokoy from the Philippines is alternately described as a classic “Gill Man” and a merman-like creature. The Russian Vodyanoy has been described as a froglike being similar to Lovecraft’s description of the Deep Ones…in addition to having the forms of a floating log, massive fish, humanoid seal and a greenish old man. While Oannes is said to have the “body of a fish but underneath the figure of a man” (which would imply a humanoid fish), most depictions show him as a merman. Some of you are sure to recognize those images as being that of Dagon, which brings us to an interesting turn of events. Dagon originally was a Mesopotamian god of grain. However, some scholars thought the name was derived from the Hebrew word for fish: “Dag.” This, coupled with the discovery of images of Oannes lead to the popular misconception that Dagon was a fish god. Dagon is referenced numerous times in the Biblical Old Testament and as a result spawned an interesting Lovecraft connection. In 1627, the inhabitants of the Merrymount colony in Massachusetts started doing very un-Puritan things like drinking alcohol and dancing around a maypole. This led to their Puritans neighbors dubbing it “Mount Dagon” for their heresy and, eventually, the destruction of the colony by said neighbors. Not only did Lovecraft know about the incident, but he also knew about Herbert S. Gorman’s 1927 novel The Place Called Dagon, which used the name “Dagon” as a way of conveying the secret blasphemies being committed in the story. Getting back to the subject of “Gill Men,” Lovecraft was not the first writer to tackle the subject in a work of fiction. H.G. Wells described such beings in his 1896 short story “In The Abyss” and Robert William Chambers’ 1899 story “The Harbor-Master” features such a creature which has an infatuation with a human woman. In 1904, Chambers would include the story as the opening of the novel In Search of the Unknown. 1911 brought us Irvin S. Cobb’s “Fishhead” and although the titular character is said to be a human being whose grotesque facial features make him resemble a fish, the ending implies a connection of sorts to the large and vicious fish of a nearby lake. H.P. Lovecraft wrote “Dagon” in 1917, but it was not published until 1919, the same year Abraham Merritt’s novel The Moon Pool (which featured humanoid frogs) was released. Said novel is an expansion of his 1918 short story of the same name. The frog creatures did not appear in that version and it’s worth noting how Lovecraft preferred the original short story to the novel. Although the story did not influence The Shadow Over Innsmouth, it is believed to have been a source of inspiration for “The Call of Cthulhu.” Lovecraft wrote The Shadow Over Innsmouth in 1931, but it was not published until 1936. Given Lovecraft’s having praised both “Fishead” and “The Harbor-Master,” it seems safe to assume they were influences on his creation of the “Deep Ones” (in addition to the Mount Dagon incident possibly having influenced the raise and fall of Innsmouth in the tale). It’s interesting to note how, despite his politically incorrect views, Lovecraft keeps his racism hidden in background of The Shadow Over Innsmouth while “Fishhead” and “The Harbor-Master” openly use racial slurs. “Dagon” was at least partially based on a nightmare Lovecraft had It’s worth noting how the giant creature described in the tale has no overtly froglike attributes (unlike the Deep Ones of The Shadow Over Innsmouth). While many fans assume the creature is the same “Dagon” worshiped by the Deep Ones, a close reading of the story suggests that may not be the case. The name “Dagon” is given to the creature by the unnamed narrator and it’s never made clear whether or not it is the only member of its species to attain its massive size. Some have even suggested it is shown worshiping in the story, which would imply it isn’t a god of any kind. Although some could argue Dagon is a “great priest” like Cthulhu, Lovecraft never indicated anything like that in his other works. The lack of a description for Dagon in The Shadow Over Innsmouth has even led some to argue Dagon is merely another name for Cthulhu! Also complicating matters is the ambiguity as to whether or not the ending of the story is real. The Shadow Over Innsmouth also has in interesting literary history. Lovecraft’s use of “Innsmouth” dates back to 1920, when he wrote the short story “Celephaïs” (which wasn’t published until 1922). But the “Innsmouth” in said story is implied to be in England while the more famous Innsmouth is located in Massachusetts. Further complicating matters is how protagonist of “Celephaïs” makes an appearance in Lovecraft’s The Dream-Quest of Unknown Kadath (written in 1927 but not published until 1943). As that work was published after his death, it is unknown if he would have changed the story to reflect the events of The Shadow Over Innsmouth or if he would publish it as it and let the reader assume yet another example of a place in New England recycling the name of a preexisting English city or town. Innsmouth also appears in two sonnets from “Fungi From Yuggoth”: “The Port” and “The Bells.” But since this work was written over a period from late 1929 to early 1930, it seems to refer to the English Innsmouth. Aside from the character of Asenath Waite from “The Thing on the Doorstep” being descended from a prominent family from Innsmouth and reusing a character that was removed from an early draft of The Shadow Over Innsmouth in another story, Lovecraft did not revisit the New England Innsmouth all that often in his later works. Innsmouth and Deep Ones were referenced in stories like “The Shuttered Room,” “Innsmouth Clay,” “The Fisherman at Falcon Point” and “The Seal of R’lyeh,” but these were “posthumous collaborations” with August Derleth. Said collaborations were actually original tales by Derleth which were loosely based on ideas from H.P. Lovecraft’s commonplace book. Derleth and other writers gradually added more connections to the Cthulhu Mythos to Innsmouth and Deep Ones have appeared in numerous original works since then. 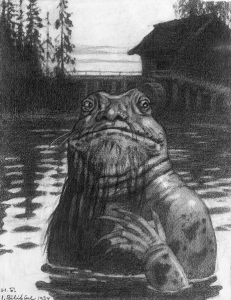 My personal favorite is Brian Stableford’s “The Innsmouth Heritage,” which can either be taken as a realistic look at the events in Innsmouth or as a rare example of a protagonist of a Lovecraftian tale toeing-but never crossing-the line of things humanity was not meant to know. One thing is for certain: it’s a refreshing change of pace from the usual post-Lovecraft stories about Innsmouth no matter how you interpret it.